Walter Kummli is an experienced editor and director of Inhouse Productions Ltd, based in Basel, Switzerland. Since its inception, all editing at Inhouse Productions Ltd has been carried out using EditShares powerful non-linear editing system, Lightworks. Founded in 1999, Inhouse Productions Ltd offer organisations the chance to bring their events or business messaging to life through video, by recording and editing concerts, lectures, product launches or corporate interviews. With a full-time team of three, plus freelancers, Walter has established Inhouse Productions Ltd as the go-to company in the region for corporate productions, video artists, trade shows and exhibitions and regularly works with some of Europes largest pharmaceutical brands. Back in 1994, while working for another company, Walter was tasked with sourcing an NLE to use on a particular project. He used Lightworks for one week and hasnt looked back since, despite the many lternatives bought to market. He cites Lightworks simplicity and uncluttered interface as a major benefit: I really like the simple approach to the interface which hasnt been overloaded with unnecessary features like other editors, he said. I feel it has been tailored perfectly to the working editor as everything is just where it should be. Other systems feature many menus and sub-menus to find the feature you are looking for. Lightworks is simple, clear and everything is where you need it to be. 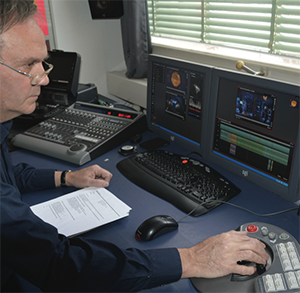 In 2005, during a visit to the IBC in Amsterdam, Walter purchased a Lightworks system, which allowed him to take advantage of networking possibilities in an open environment without manufacturer-specified disk requirements, licenses and pricing. Since that original purchase, Walter hasnt looked back and remains a committed Lightworks user, enjoying the latest software developments and new features. Lightworks also provides mixed compression formats on the timeline, instant software switch for HD/SD output, and real-time effects without rendering, while all files and metadata are compatible and instantly available on any shared storage device. "Ive worked with people who are familiar with other systems and often find them looking over at what Im doing on Lightworks and are surprised at how fast Im able to edit", comments Walter Kummli, editor and director of Inhouse Productions Ltd. Previously Walter was only used to working offline but was immediately impressed with the online capabilities of Lightworks, and its speed: Its incredibly fast to use and does everything you need. Ive worked with people who are familiar with other systems and often find them looking over at what Im doing on Lightworks and are surprised at how fast Im able to edit. With a lot of Walters work taking place within the corporate environment, interviews can form a large part of the shooting schedule. Being able to quickly and effectively edit these is another advantage to using Lightworks thanks to its ability to input the feed from three separate cameras and use all at once, on the same screen. Not only does being able to see all three cameras at same time help with the speed and accuracy of the interview edit, Lightworks sound capabilities were also highlighted as a major factor: When shooting interviews or round tables, the sound is very, very important so being able to line everything up easily and accurately is really crucial. Using Lightworks console you can slow down the footage while the quality of sound remains intact, making the job of perfectly lining up the sound and audio extremely easy.